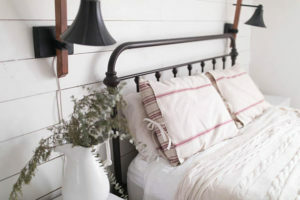 Want an instant boost on the “rustic feel” scale? 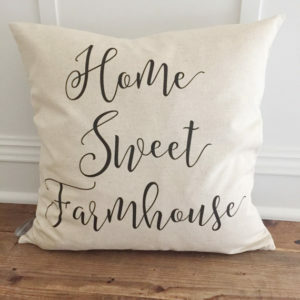 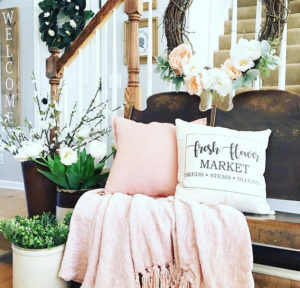 Adding rustic or modern farmhouse pillows to any and all rooms in your house will give your home an instant boost on the “rustic feel” scale. 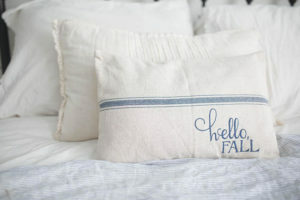 The pillows will make your home look cozy and feel welcoming. 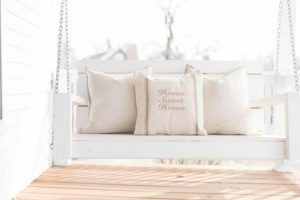 The elegant simplicity will take you back to less-hectic times and will have you dreaming of drinking ice tea on the porch after a long days work on the fields…. 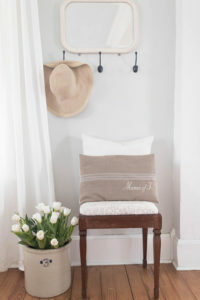 Did you know that through the use of fabric you also can change the acoustic of your space? 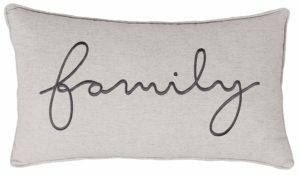 The fabrics will absorb the noises in the room and reflect a more “muffled” sound, which is easier on the ears for all of us. 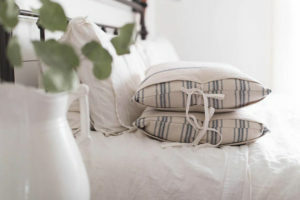 You, your family and your friends will instantly feel at ease, without realizing that it is the strategic use of decorative pillows that caused this harmonious feeling. 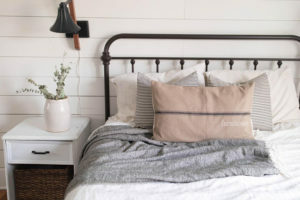 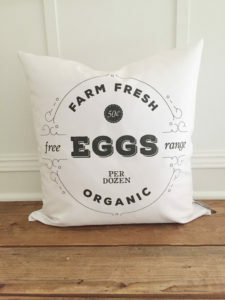 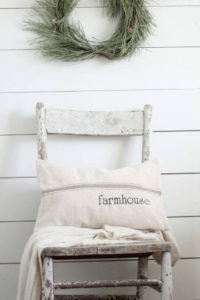 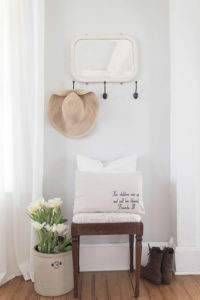 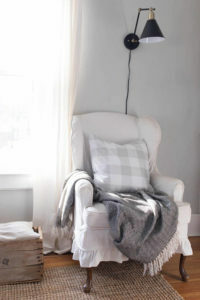 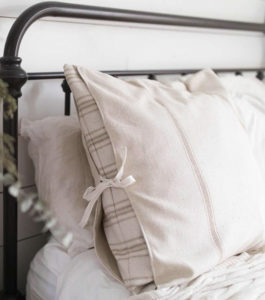 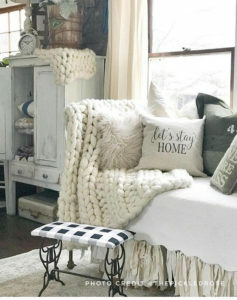 The materials used most often for farmhouse pillows are cotton, linen and burlap. 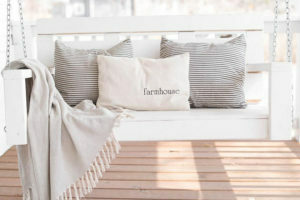 These materials are sturdy and durable, they represent the laid back, relaxed atmosphere we love to create in our homes. 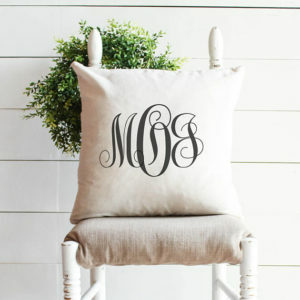 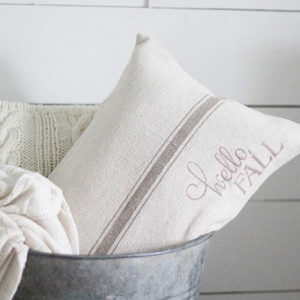 The designs range from grain sack stripes to personalized monograms, from buffalo check to no design at all. 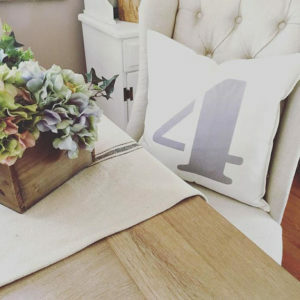 But do not underestimate the “just plain” covers though, they are hugely popular, as they are timeless and fit easily in any modern or rustic farmhouse decor. 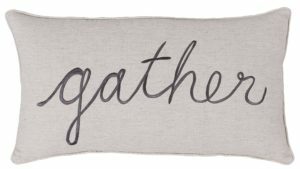 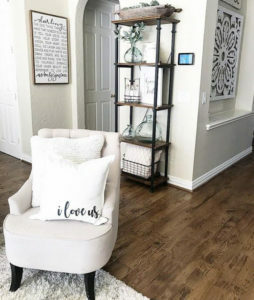 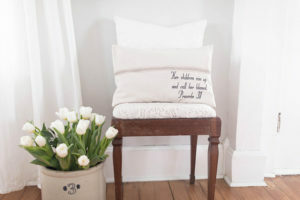 Pillows with quotes are a big thing ever since Joanna Gains started adding them to her fixer-uppers – and I must admit, I love them too! 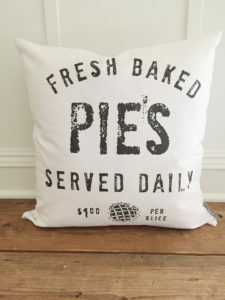 I have put together a collection of, in my honest opinion, gorgeous pillows and pillow cases. 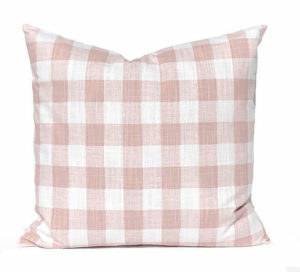 Before you buy, please make sure to check what you will be getting; the whole pillow, including inlay, or just the cover. 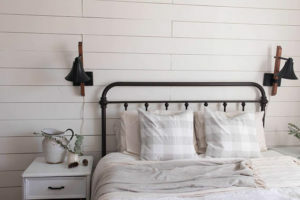 Yes, I was once too quick to order and only got the covers… which was not such a big deal, as I have plenty of inlays, but still, I expected something else. 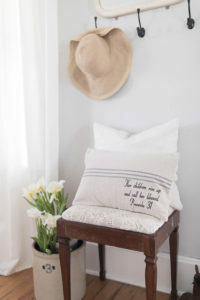 Let me mistake be your lesson :-). 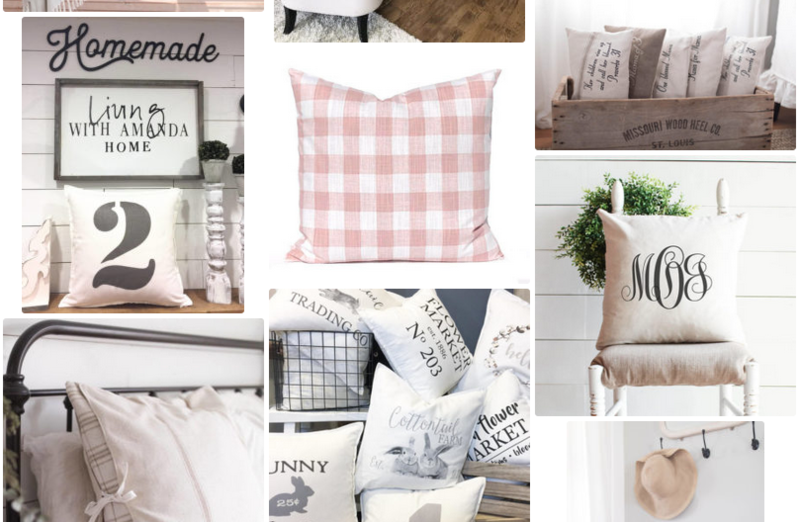 Most of the pillows featured in this post are made by super-kind and highly-talented people on Etsy. 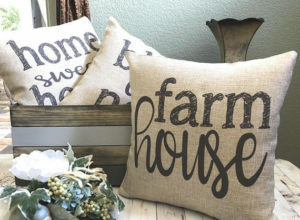 I am on Etsy a lot, as I just love the craftsmanship of the products on there. 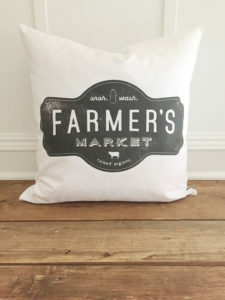 I also like to know that I am supporting local artists with my purchases. 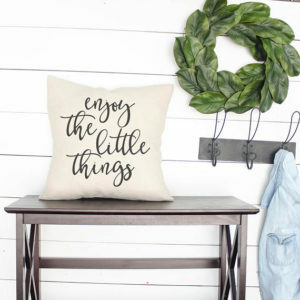 Some of you are big Amazon fans, and because I found some gems there as well, I will be adding some products from Amazon to the collection too. 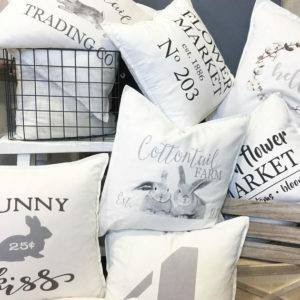 As Wayfair also has quite a large selection with pretty patterns, as do World Market, Pier One and who knew, Michaels, they will not be left out either. I hope there is something here that inspires you to get some pillows for your home, or a friends place. 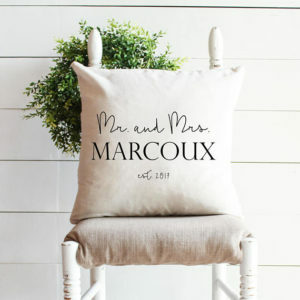 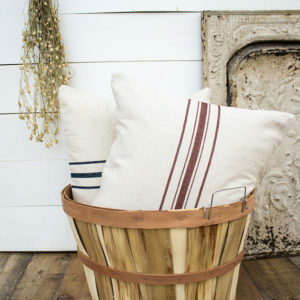 These Rustic pillows make a perfect gift too! 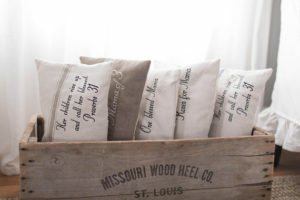 Can you think of someone who would love to receive one of these gorgeous pillows? 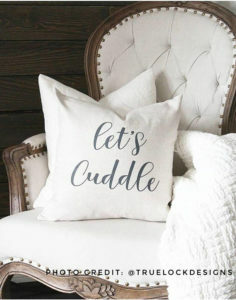 Or is it time to treat yourself? 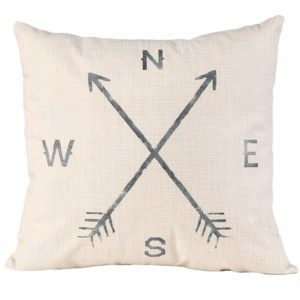 Have fun browsing and feel free to click any of the product pictures to get to the sellers site directly. 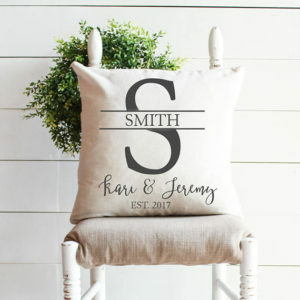 As you might know, I will be getting a small commission (at no extra cost to you!) 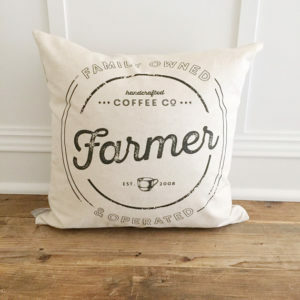 when you decide to buy a product through one of my links, a big thank you for that. 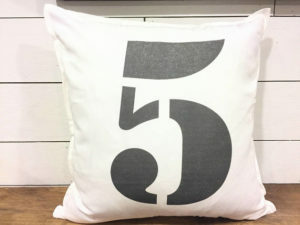 And huge thank you for visiting my site, I truly love having you here! 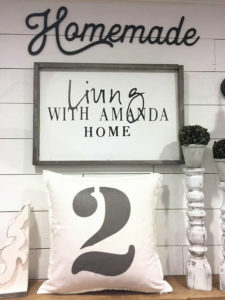 Feel like sharing your own pictures? I would love to see where you put these pillows in your home!